Howard E. Olson has been a member of Parks & Trails Council of Minnesota and its predecessor organizations starting in 1967, a time when the group was helping create Afton State Park, many of the North Shore state parks and expanding the size of William O’Brien and other parks. P&TC board member Martin Kellogg, who has known Olson since the 1970s, said he puts Olson in the group with the leaders and visionaries that grew P&TC and greatly expanded the state’s park system. Bill Morrissey, who was the Minnesota Department of Natural Resources state parks division director from 1987 to 2004, remembered Olson playing a major role in getting the state funding in a bonding bill for what became the Tom Savage visitor center at Fort Snelling State Park. “I believe he went to the governor (Arne Carlson), maybe with some other folks, he got that built,” Morrissey said. According to his son, Jeff Olson, his father came by his love of parks naturally. Growing up in south Minneapolis during the depression, he would camp with his Boy Scout troop in the wilds of what is now Bloomington and near Fort Snelling in the river bottoms. In the summer of 1941, after his freshman year at University of Minnesota, he was selected to spend the summer at the university’s Biological Research Center at Lake Itasca State Park. He later spent a summer at Olympia National Park in Washington. As well, he was an avid camper, hiker, skier and canoeist, his son said. 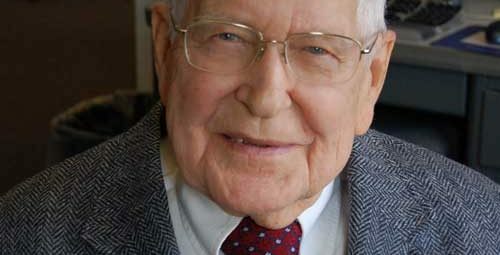 Olson served with the U.S Army Air Corps during World War II and then returned to finish his forestry degree at the University of Minnesota. He went to work in the wood preservation business, first with Chapman Chemical Co. and then nine years later, taking over his own business, Sonford Products North in St. Paul Park. While he was active in the Lutheran Church and served on the board of regents for Augsburg College, it was parks and trails where he spent the majority of his energy. Morrissey, who also was on the P&TC board with Olson, said his style was that if there was a difference of opinion, he would be the negotiator trying to find a way to keep everyone on board. His long service, and his two different stints as board president, eventually resulted in Olson receiving the highest award Parks & Trails Council gives, the Reuel Harmon award, named for his former board colleague. Olson also served on Gov. Rudy Perpich’s Blue Ribbon Committee on Forestry in 1987, was a member of Gov. Al Quie’s economic mission to Norway and was interim director at the Dodge Nature Center in West St. Paul and the Carpenter Nature Center in Hastings.